Although not officially a reunion, this was the first general meeting of Sackett cousins. 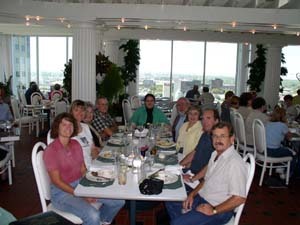 By Friday 26 September 2003, everyone had arrived in Salt Lake City for the first meeting of the TSFA Steering Group. Before this date, genealogy research was achieved with varying degrees of success but with overall high admiration for the facilities at the Family History Library. Tom Smith and Lauri Sacket Diel joined TSFA Steering Group members, Thurmon King, Liesa Robarge, Chris Sackett, Wendy Sackett and Nancy Cluff Siders. In addition, Sylvia King and Bill Siders who just happen to be the spouses of Thurmon and Nancy contributed excellent ideas and support. From this group, our original goals of Research, Share, and Preserve were reaffirmed as extremely valuable to this association. These attributes were expanded upon by noting the objective of pooling our resources into a network of connections with a deep commitment to the challenges of achieving the goals of TSFA. Research is on-going by TSFA and Sackett-L but it was agreed that the capability to accomplish further research will always influence the selection for the location of the bi-annual Family Gathering. Share will be expanded with the publication of newsletters and of course the continued support of the Sackett-L mailing list (existing since 1997). Preserve exists on the many web pages and will continue through the future consolidation of all sites into a cohesive and more protected TSFA web site. In addition, we are working on preserving data electronically by sharing computer resources and finding a basis to preserve Sackett collections as one. Whatever decisions the Steering Group may have accomplished in SLC can never surpass the value of meeting the members in person. Email is great; commitment and dedication to the Sackett surname do come through in messages but nothing compares with seeing sincere expressions on human faces. Meeting your cousins in person is enough reason to set your mind now to plan to attend the next TSFA Family Gathering. A Family Gathering survey has been sent to Sackett-L and TSFA to assist us in the planning of such an event.